A new paper by Raymond La Raja and Brian Schaffner of the University of Massachusetts at Amherst suggests looks at the idea of using lotteries for boosting voter turnout. Buying Voters: the Effect of Financial Incentives on Intentions to Vote uses survey data from the 2011 Cooperative Congressional Elections Study to demonstrate that a lottery could indeed increase turnout – especially among under-represented groups. My favorite [turnout] incentive approach is a “Mega Millions lottery,” where one’s voting receipt is also one’s lottery ticket. The lure of a major prize could and would motivate people to vote, the same way the multimillion dollar Mega Millions prize in 2012 motivated many to stand in line for hours for a chance to buy a lottery ticket that gave a one-in-176-million chance to become a multimillionaire. A lottery could increase turnout dramatically and overnight, and is a model that could be employed at all levels (say, a chance to win a car donated by a local dealer for a local election). elections. Nonvoters rated their likelihood of voting 23 points higher when offered the prospect of a lottery system that offers 100,000 people the chance to win $2200. Notably, lottery systems offering fewer chances at larger payouts generated no such increases in turnout. The psychology behind this perspective is rooted in a variant of Prospect Theory, which posits that individuals would prefer the certainty of small gains over the uncertainty of a large one. While the odds of a voter winning one of the prizes is only .045%, these odds appear better than a 1 in 220,000,000 chance when the lottery goes to just one voter. Regarding the latter figure, shouldering the cost of voting does not seem worth it to a nonvoter when the odds of getting a reward are so miniscule. Before you get all excited about turning that “I Voted” sticker into cash, however, remember that federal law (and lots of states as well) prohibit any kind of financial incentive for voting – even free cups of coffee or ice cream cones. So, any lottery would require significant policy changes (and would likely engender fierce debate about whether or not to “reward” habitual non-voters via incentives). Still, it’s a fun thought experiment – and a nice lead-in to the Labor Day weekend. Take care, and we’ll see you back here on Tuesday September 4. 2 Comments on "Voting FOR Your Wallet? New Paper Examines Lottery-Based Incentives for Voting"
This story speaks volumes about how pathetic the citizens of our democracy have become. Here’s a novel suggestion if you are concerned about winning money for voting; how about you concern yourself enough to vote, not because you could win millions of dollars, but because tax levies worth millions of dollars, and politicians that will pass laws that may effect your taxes are on every ballot. Nominal awards like a lottery based voting ballot could cure voting apathy, and if unrigged, could smooth the resistance to voting that comes from the Electoral College effect where voters do not feel their votes count. By state, or by one general lottery drawing could help voters believe they would get at least a nominal benefit from voting. Another incentive would be a national holiday for voting respected by all states so that voting could become popular again, and reduce the chance of government corruption that voters presume is the norm recently by lobbyists, privateers playing the system. 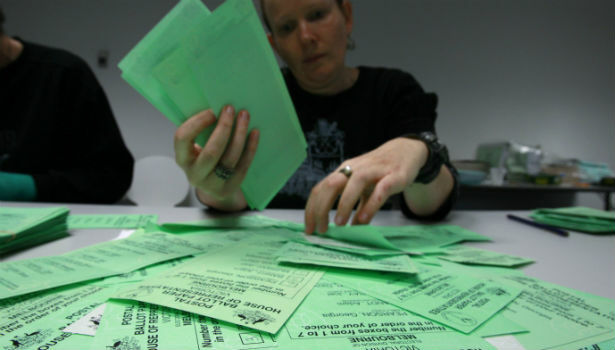 Lotteries are successful for everything else; why not voting rather than mere duty stickers?